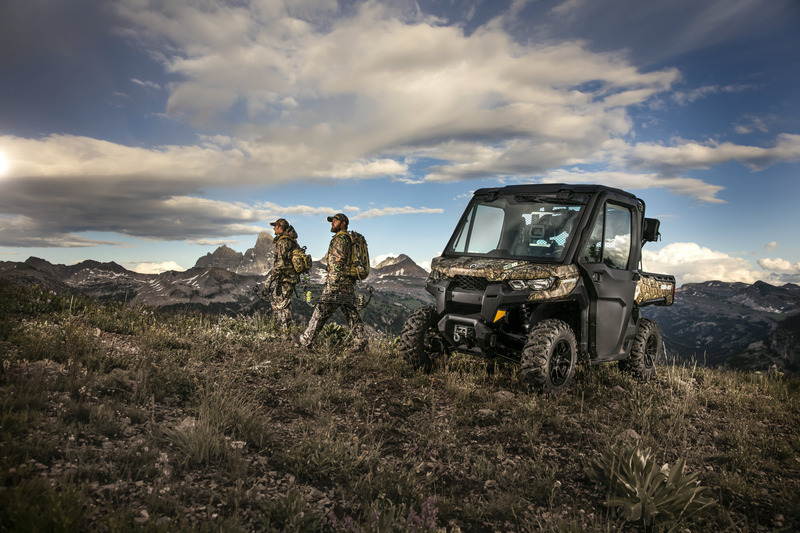 Defender offers a new 4-mode traction system providing choices for varying terrain or tasks. Users, via a separate front-and-rear toggle switches, can select between a 2×4 open rear differential for tight turning and turf protection, a 2×4 lockable rear for improved 2WD traction, a 4×4 open rear for more maneuverability in rugged terrain and a 4×4 locked rear for maximum traction. The highly durable Cargo box has a 1,000 pounds / 454 kg (600 pounds / 272.2 kg in California model) load capacity and has dump assist levers. It also features a versatile configuration that can create a customizable dual-level setup or completely separate compartments. Strategic features include 5-gallon (18.9 L) pail recesses, integrated anchors on the sidewalls and several tie-down points for added convenience. To fully optimize the sizeable cargo box, consumers can divide up the box using the integrated recesses. The box allows for both 1×3 (inch) and plywood separators and accepts bed extenders for refining the bed’s overall dimensions. The cargo box is adaptable to accept 14 LinQ quick-attach accessories for further customization.